If you are going through the process of having your windows replaced, you'll hear conflicting arguments for or against triple-glazed verses double-glazed windows. If you are serious about getting the best quality, best energy-savings and best value in today’s window replacement market, then you really need to do your own homework, and draw your own conclusions. This blog entry is intended to give you an impartial look at the variables and factors affecting the most current window prices and performance. We hope this information provided will help you decide which option are best for your family and your home. Before you start, here are a number of glass attributes that affect a window’s efficiency. Lots to consider. Unfortunately, these attributes are rarely published and available to the average consumer. That’s why Energy Ratings are so important, they are the only standardized unbiased measurements (tested and measured by a neutral authority) available to help you make an honest comparison between windows. The best resource for honest energy-efficiency measurements are available from the NRC Canadian Government sponsored Energy Star website, here you can search for windows by a variety of queries. Below are the main energy-efficiency ratings as they pertain to glass. Keep in mind that window manufacturers typically provide customers with several glass options to help produce the desired result (e.g. less light, less heat, more insulation…) which can lower or raise energy-rating values. Energy-efficiency is great, but what about about home comfort? In Ottawa (climate zone 3) the energy-efficiency prime directive is focused on keeping heating costs down in the winter as statistics show heating costs far outweigh cooling costs. However, in many cases, energy-efficiency may mean a sacrifice in home comfort. This is exactly why most window manufactures give you varying levels of glass options and why when you are buying windows, even though there are manufacturing standards, you cannot really make apples-to-apples comparisons. OK, so which is better, triple or double glazing? For purposes of understanding the statements below, we’ll pretend we are using the same glass, gas and spacer attributes for both the triple and double-glazed windows. Here are the facts. Triple-glazed windows are typically better than double-glazed windows at helping to keep the air temperature inside the home at consistent temperatures. Triple-glazed windows typically allow for higher levels of humidity and lower condensation than double-glazed windows. Weigh less than triple-glazed windows. Do not have to be as strong as triple-glazed windows to support the glass. Are easier to lift for installation. Weigh more than double-glazed windows. Quality triple-glazed windows are engineered to handle additional glass weight and are unaffected by the weight when operation. If concerned about weight and durability, look for products with higher year warranty coverage. Double-glazed windows allow a little more light and solar heat into the home than triple-glazed windows. Standard triple-glazed windows are slightly better at filtering out UV rays than double-glazed windows. 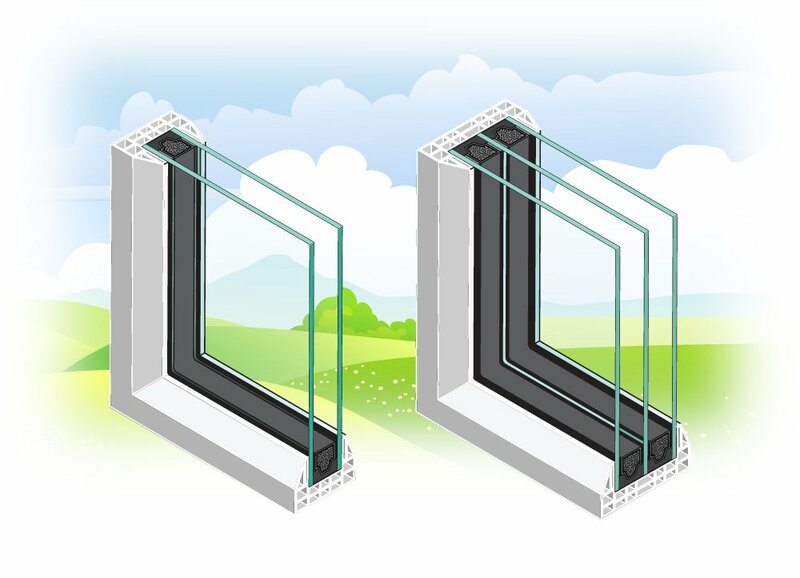 Triple-glazed windows typically have a better thermal Insulation (U-value) double-glazed windows. When low-emmisive glass is being used, the extra low-emissive coating in triple-glazed glass tends to perform better at stopping the summer heat from entering the home in the summer and from escaping in the winter. Double-glazed windows tend to be less expensive than triple glazed, although the gap between costs has been decreasing as companies that have converted to triple-glazed technology become more competitive. Triple-glazed windows have warmer inside-the-home glass surface temperature in the winter which can improve relative humidity levels in the home and decrease the potential for condensation. Triple-glazed windows tend to be slightly quieter than double-glazed windows, however if sound proofing is a requirement you should look beyond standard glass configuration. For more information consult your window consultant.